The West Indies tour to India has been called off suddenly due to the ongoing payment structure dispute between the players and the West Indies Cricket Board (WICB) and WIPA. The fourth ODI in Dharamsala will be their last game of the series, which was scheduled to have a fifth ODI, a Twenty20 international as well as three Tests. India will now play five ODIs against Sri Lanka between November 1 and 15, after Sri Lanka Cricket accepted the BCCI's invitation to fill the void. The BCCI said it was "shocked and disappointed" and that the decision to abandon the tour had been "taken by the WICB." What led to the West Indies pullout? September 19 WICB and WIPA sign new bargaining agreement and Memorandum of Understanding. WIPA president Wavell Hinds says agreement "not perfect", but brings stability to the system. October 7 West Indies players threaten to sit out the first ODI against India and claim that Hinds "hoodwinked" them while signing the MoU. October 8 West Indies play the first ODI, but the captain Bravo asks Hinds and other WIPA officials with conflict of interests, to tender their resignation immediately. October 11 Bravo writes to WICB president Dave Cameron seeking an "urgent intervention" over payment issues between the board, the players, and WIPA. October 15 The growing impasse between the players and WIPA intensifies, with the players and WIPA exchanging emails. Hinds denies all claims made against him and says senior West Indies players had expressed "100% support" towards a resolution. Bravo denies any such a resolution was passed. October 16 WICB says it will "engage" only with the WIPA, and not the players, to resolve the issue. October 17 West Indies play the fourth ODI against India in Dharamsala, but news breaks during the game that the rest of the tour has been abandoned. "They have withdrawn their team and this (development) has come abruptly. We received an email from Richie Richardson, the West Indies team manager, only this [Friday] morning," BCCI secretary Sanjay Patel told ESPNcricnfo. Patel also told PTI that the BCCI was contemplating legal action against the WICB. "The reason given by WICB is that there were internal issues among their boys. The BCCI will be going to ICC and is planning to sue the WICB and claim for damages. We will not take this lying down as we have cooperated with them in every aspect," he said. The BCCI's release said, "The WICB's inability to resolve internal issues with its players and allowing the same to affect an ongoing bilateral series does not reflect well on any of those involved." The withdrawal had, "given little thought to the future of the game, the players and the long standing relations between the BCCI and WICB." "This is a unilateral decision taken by the WICB and its players, in spite of several appeals to the WICB to honour its commitment and complete the series." The BCCI would, "pursue all options available" and seek "appropriate action" from the ICC, referring to the abrupt end to the tour as an act of indiscretion. BCCI joint secretary Anurag Thakur told PTI the West Indies players were "hell bent not to play" the fourth ODI, and only agreed to take the field upon his insistence. Before the game, Dwayne Bravo, the West Indies ODI captain, had indicated something serious was brewing when he told Ian Bishop, the television commentator, at the toss: "Time to make a decision." 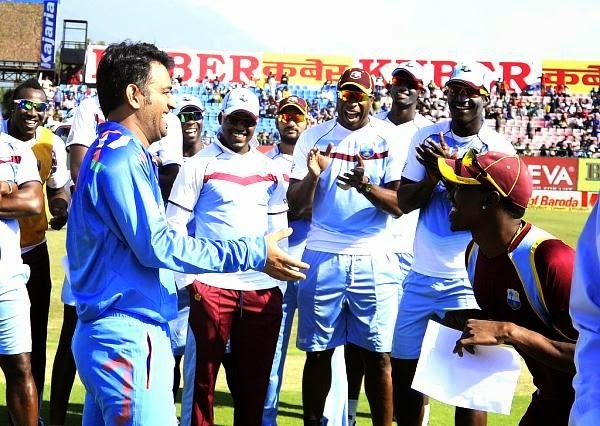 Bravo was accompanied by his West Indies team-mates who stood beside him. Tony Irish, the executive chairman of international players' association FICA, is reported to be working with WICB and WIPA to try and resolve the issue. "It is always unfortunate when players pull out of a tour," he said. The reason for the dispute between the West Indies players and WIPA had been the memorandum of understanding and the combined bargaining agreement signed between WIPA and WICB in September. Bravo, acting as the player representative, had claimed that WIPA president and CEO Wavell Hinds had kept the players in the dark over the MoU, which he allegedly signed without their consent. On the eve of the first ODI in Kochi, Bravo had warned that if Hinds did not cooperate and respond to the questions raised by the players, a strike or a pullout from the tour could not be ruled out. Though Hinds responded eventually, Bravo continued to insist that Hinds should step down as CEO and president, and even asked the WICB to not communicate with WIPA till a solution was found. However, WICB president Dave Cameron sent an email to Bravo saying the board would only engage with WIPA, adhering to the MoU signed in September. Some people thinks that West Indies Board Understand that they have not enough power to win the series .So they Called off the series . I heard that WI forced to play the 4th ODI - Is it true ? Yes , It is true . They are forced .